THE GO! 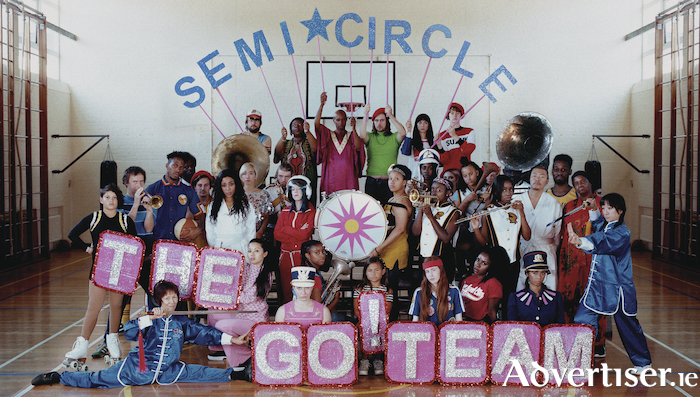 Team's fifth album occupies a space equidistant from the funk, soul, and samapdelic urban of 2010's Rolling Blackouts and 2015's indie-pop/dream pop The Scene Between. The vision of band founder, songwriter, and multi-instrumentalist Ian Parton was for Semicircle to sound like a "school marching band gone rogue, chucking away their sheet music to blast out Northern soul stompers or Japanese indie-pop swooners or old-school hip-hop jams." He has largely achieved that. It's a form which characterises the single 'Semicircle Song', featuring The Detroit Youth Choir, but is heard to even better effect on opening track 'Mayday'. Mixing funk horns, street chant vocals, and a stinging guitar motif that is incredibly straightforward, yet inspired, it's strutting institance captures the enthusiasm and high energy so characteristic of the Brighton collective. 'All The Way Live' is very effective old skool hip hop, with some strong melodic twists and a quiet/loud dynamic. The more indie side of Parton's songwriting is captured on the beautiful 'Chain Link Fence', with its various samples creating a lush bed for the melody to lie in, while 'The Answer's No - Now What's The Question?' is bittersweet, anthemic, indie-pop par excellence. The psychedelic guitar breakdown in the middle proves a contrast which nonetheless fits in perfectly. There is no getting away from the presence of a number of pedestrian songs and The Go! Team by numbers tracks, but an album with this much aural colour, joy, diversity, and pop smarts has enough to ensure it leaves a mostly satisfied feeling.